Full event live stream schedule featuring the Official Black Desert Online Guild 3v3 Tournament Final and amazing giveaways. 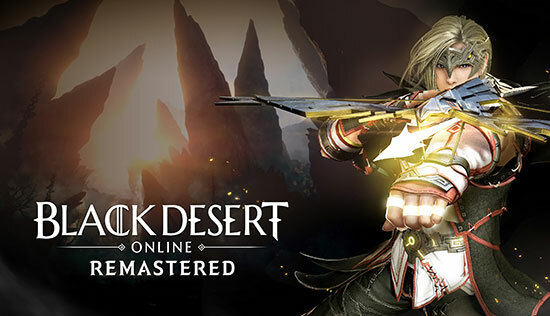 Black Desert Online will showcase its brand new Archer class for the very first time at this year’s TwitchCon which is being held at the San Jose McEnery Convention Center. The event takes place between the 26th and 28th of October. Aside from checking out the Archer class, players will also be able to experience the brand new Drieghan expansion which is set to launch on November 14. All of this brand new content will be playable on 46 high-end Alienware Aurora PCs at the Black Desert Online Booth (#808). During TwitchCon Kakao Games are planning full day live streams throughout the event featuring partnered streamers such as GoodVibes Guy and Dr. Positive who will be hosting and shoutcasting the Official Black Desert Online Guild 3v3 Tournament Final where finalists from North America and Europe are battling for a $10,000 grand prize. Morrolan TV will dive into the lore and capabilities of the new Archer class and explore Drieghan. AionJanis “the dancing streamer” will throw an after party stream that will amaze Black Desert fans and newcomers alike. The Archer, previously coined as the male ranger was a much requested class by the Black Desert Online community worldwide. As guardian of the Netherworld the Archer uses his Crossbow for his stylish ranged attack and skill combos. The Archer also uses various different magic skills that assist him in combat by upsetting the opponents’ balance, and wreaking havoc upon whoever stands in his way by bombarding arrows with his Crossbow from afar. The Archer is never flustered nor disoriented, even when surrounded by countless enemies as he can escape from them without breaking a sweat. Drieghan, also known as the land of dragons and the ancestral home of dwarves is a huge new mountainous area in Black Desert Online offering new story content, quests and challenges. Adventurers will be able to travel to Duvencrune, the capital of Drieghan which shows a variety of environments of an alpine region. New monster areas such as ‘Sherekhan's Grave, ‘Blood Wolf Town’, ‘Tshira Ruins’ will be released as well as the new dragon world boss, Garmoth, the Crimson Dragon. Players can also look forward to the Dragon Slayer, a brand new powerful craftable weapon which nearly matches the “Dandelion” weapon. This brand new update slated for a November 14 release will feature a large mountainous area, over 300 challenging quests, fresh nodes to conquer and a new menacing dragon boss called Garmoth. Black Desert Online is an open world action MMORPG with cutting edge visuals and skill-based combat that redefines the genre. Black Desert Online has the most fully developed character customization system of any game that is currently on the market. This feature allows users to break free of the mundane and make unique characters that are truly representative of each and every player. Its intuitive controls, beautifully designed worlds and extensive lore are enough to excite both new and veteran gamers of MMORPGs and RPGs in general. The game has been successfully launched in over 150 countries, is available in 12 languages and has over 10 million registered users. The mobile and console version is scheduled to launch globally in 2018. About Pearl Abyss Pearl Abyss is the Korean studio behind the hit PC MMORPG Black Desert Online which was named MMORPG of the Year in 2016 and 2017. It has been successfully launched in over 150 countries, is available in 12 languages and has over 10 million registered users. The mobile version launched in Korea and became an instant hit. Black Desert Mobile reached the number one position as the Most Popular Game in the Korean app stores for both Apple and Google in less than a week. It is scheduled to start launching globally in 2018. All of Pearl Abyss’ games are developed on their own proprietary game engine. Pearl Abyss is poised to continue its growth through 2018 and beyond to maintain its position as one of Asia's leaders in game development. Recently Pearl Abyss acquired the AAA developer and publisher CCP games, known for their EVE Online franchise More information about Pearl Abyss is available at www.pearlabyss.com About Kakao Games Kakao Games is a leading publisher of online and mobile games. Founded in 2016, Kakao Games is responsible for servicing a variety of games, including Pearl Abyss's Black Desert Online (Serviced in North America, Europe and South Korea), Bluehole’s Player Unknown's Battlegrounds (Serviced in Korea) and Ascent: Infinite Realm (Scheduled to be serviced in North America and Europe).